We’ve all grown used to wonders of technology in this century therefore it’s very hard to dazzle anyone these days. We, probably like any other developing business, wondered what is to be done in this context? What is the way to success or the path to growth in such a competitive market where users are overwhelmed with great apps and tools designed to make their personal and professional life considerably better? We kept on looking for answers for a while but every single time we came out with the same conclusion: the path to growth is the path our users walk on. Innovation is a catalyst to growth. It can be viewed as the use of better solutions that meet new requirements, unarticulated needs, or existing market needs. This is why we decided to take our highly appreciated Instant Backlink Explorer to the next level – technologically and visually. 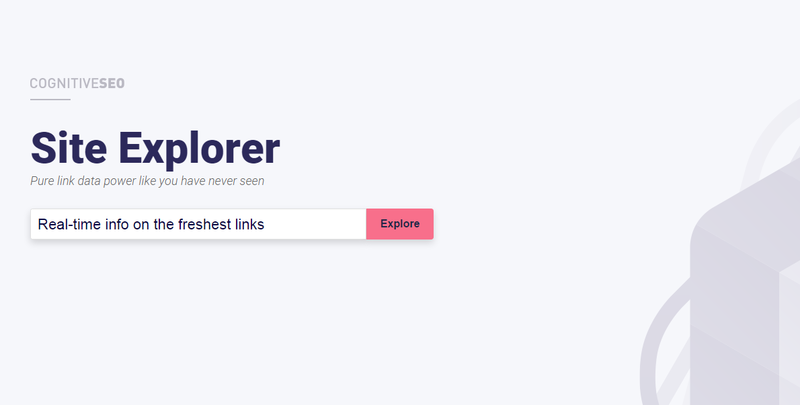 It is my pleasure to present you the fresh Site Explorer. Offering in-depth, real time and instant link data for any website is great and very useful at the same time. Yet, what if we could offer the same real time data for rankings as well? What if we could extend our research from links to rankings, offering to our users not only pure link data like never before but also growth opportunities in terms of rankings? And what if we did that in a brand new appealing design that would offer our users the best experience they’ve had? The good news: we just did all the updates mentioned above. The best news: the brand new powerful Site Explorer remains open so that anyone can use it. As you are going to see by playing around with the Site Explorer, a couple of things have been improved and new features have been added. Probably the best of them is the Rankings new tab, a module that integrates Search Visibility data to offer you a complete overview for any website. Before stressing on the main benefits that you can get from the Search Visibility data, indulge me to explain a bit what this visibility is and why it is important for every website owner or digital marketer to be aware of it. The Search Visibility reflects how often a website shows up in the search results. It’s essentially about monitoring the search performance of a website as it presents the historical development of a domain’s visibility in Google. The Search Visibility is calculated based on millions of keywords that are tracked in Google on their importance and traffic volume. Each keyword has a particular importance and based on that and the ranking of the tracked site a SEO visibility score is calculated. This score is updated weekly. Therefore, the Search Visibility provides unparalleled insight for any SEO Professional as it allows you to see not only the current visibility but also the data from 1 month to 2 years. We will be honest on this and admit that there are indeed dozens of SEO tools out-here that offer rank tracking analysis. We, at cognitiveSEO, are very proud of our own SERP Checker that provides one of the most in-depth keyword analyses. Yet, how is this new ranking analysis from the Site Explorer different than anything these tools have to offer? We are using the SearchMetrics data to power the rankings information. First of all, within the Site Explorer you can see your and your competitors’ rankings instantly for the period of time chosen by you and on the country or countries that interest you most. Have I also mentioned that all this is for free? That’s right: In-depth analysis, instant results, all for free. All you need to do is add your website and start exploring through trillions of links and rankings. The Rankings section that the Site Explorer has to offer is just one of the platform’s features, along with link analysis, referring domains or broken page examination. We are going to talk about them in the near future as some new great improvements are going to be made in this area. Returning to the Instant Ranking analysis, let me show how it works. After adding the website you are interested in you need to select the country you want the data to be showed for. Later on, you can change the country and visualize the Search Visibility on any of the countries listed in the screenshot below. As we were interested in the Michelin Starred Restaurants in the UK, we’ve added The Fat Duck‘s website, one of the most successful restaurants in its niche. For the beginning we wanted to analyze the Search Visibility for the last year alone. However, we could have checked it for up to 2 years or for the last month. The period of time you want to visualize the data is fully at your discretion as you are the one who decides what you want to see and when you want to see that. Along with the data, you can switch between the countries mentioned in the screenshot above anytime you want. We begun analyzing this website’s performance in the UK; yet, being a world-class restaurant we are talking about, we will get precious data from checking the visibility in several countries. Conducting such an analysis can give us a lot of info that The Fat Duck’s digital marketers can take advantage of: What other countries should they concentrate their efforts on? Why is the Visibility in USA so low and what can we do to improve that? etc. As mentioned before, it is very likely that any SEO Professional or website owner already uses a SERP Checker. What is different about this is the ease of use and the instant results you get. Not to mention the amount of sites you can analyze with it. Usually, SEO tools have all sorts of limitations (and with good reason) when it comes to offer you rankings info. The Site Explorer offers you the possibility to check out hundreds of sites, helping you to see all of them just the way Google sees them. According to Wikipedia, competition is the opposite of cooperation. Considering the fact that competition is one of the “forces” which pushes you to do better, we don’t know if we can totally agree with the free encyclopedia’s definition. Competition is always a good thing. It forces us to do our best. The direct comparison between you and your competitors offers access to more in-depth analysis options. You know exactly where you’re standing in your niche as you now have the possibility to make direct comparisons with your competitor, as far as your Search Visibility is concerned. We remained in the Michelin Starred Restaurants niche as we analyzed in a side by side comparison The Fat Duck and two of its main competitors, Alain Ducasse at the Dorchester and Restaurant Gordon Ramsay. We wanted to see what these sites’ overall performance was for the last year in the UK. It takes just a few second to spot the big winner of this “competition” but also the one who has the most promising evolution in terms of visibility. We are given info on the visibility but we also get data for the visibility changes as compared to last week. There’s nothing that leaves SEO professionals and digital marketers feeling equally confused and concerned like a sudden Google algorithm update. With all the fluctuation in SERPs due to the ever changing ranking rules we wanted to take the “penalty identification” process to another level. Every time you’re trying to figure out what happened to a certain website, the first chart you should look at is the Search Visibility one. Just by taking a glance at this chart you can easily see whether there are significant downhills in a website’s history that can reflect a Google “red flag” or whether that site’s online visibility is stable and doesn’t have dramatic ups and downs. To make it easy for you to correlate any spikes or drops with Google updates we give you the possibility to show Google updates on the chart. Therefore, any update that took place in the last 2 years is marked with a red flag on the chart, as you can see in the screenshot below. Spotting penalties have never been easier. Not only you can see the current situation of any website but you also check out for penalties in a historical trend. Depending on where your site is ranked in search engines for different keywords, its ranking position has a major impact not only on your web traffic stats but also in terms of lead generation and conversions. A study shows that around 90% of all search engine users click on a result on the first page. Although we can spot a paradox, the truth is that everybody wants to rank on search engines’ first pages. Most site owners are struggling on how to improve keyword rankings. “What keywords does my site rank for?” “How does my site rank for keywords I’m most interested in?” “What is the search volume or the Cost per Click for my most important keywords?”. All these questions have now a simple answer and that is the Site Explorer. As you can see in the screenshot below, you are listed with the top 20 keywords for any website you are interested in, along with data such as Traffic Index, Search Volume or CPC. And all of this with the minimum effort on your side. If the classic keyword analysis tools make you go trough long on-boarding processes where you have to add a lot of info about your websites, our Site Explorer allows you to see ANY website’s ranking keywords for ANY country in just a few seconds, just by adding that site’s URL. Quite a breakthrough, right? At the end of the day, what most of us want is to get more clients. For that to happen we use several tools and apps in order to spot the best opportunities for pitching new clients. The reality is that our marketing communications world is changing at a rapid pace and pitching new clients can be quite a challenge sometimes. However, having a strong competitive advantage in front of other agencies can be a real breakthrough. Having access to any website’s historic visibility data can get you new and valuable clients. You can not only present your client the opportunities that he has on the market or dissect his competitors’ SEO strategies but also have instant access now to his historical performances. let them know if they had a past or a present penalty. All these data is top quality info and you might be the only one who can provide this sort of substance. We, at cognitiveSEO, believe in the power of innovation and we are committed to offer our users exactly what we promised: Cutting-edge SEO Tools. These updates and features are just a few in a series of many others that are due to come. Just like everything else we create, this new update is oriented towards you, our beloved Cognitive and your opinion values a lot for us. Therefore, how do you find our brand new Site Explorer? Wow, Seems to me a promising one. Will have a trail and see how it can be helpful for my research. Enjoy using the tool and let us know what you think about it. I like this tool and have been using it for a few days! Any chance you will put in a quick pdf export for the overview? Would be great! Zack, thanks for the feedback! For the moment CSV and EXCEL format are available only but we might consider adding PDF as well.